"You were expecting something else? Something like... THIS!?" When Makuta is on the brink of defeat, the Mask of Ultimate Power transforms him into a disembodied vortex of shadows and elemental energy. With nothing left but his Mask of Control and the desire for revenge, Makuta uses this form to lash out at the Toa and Ekimu in his final moments. 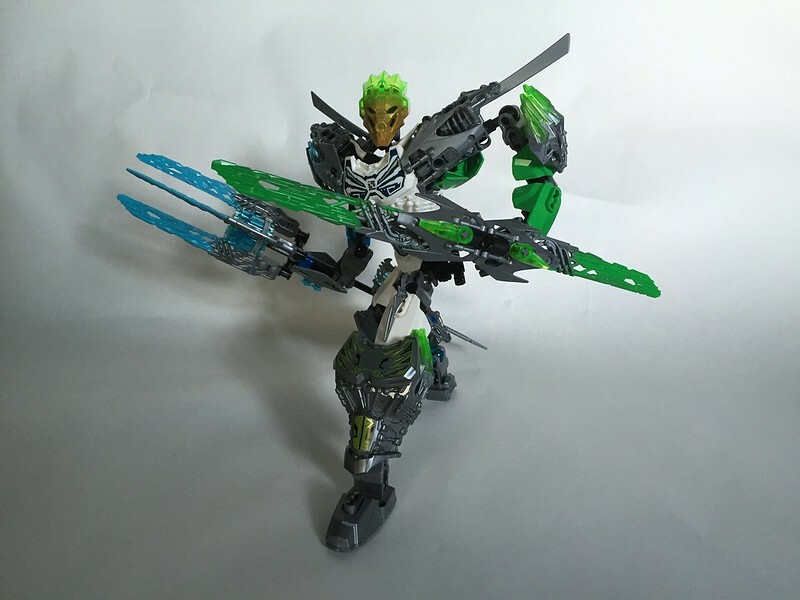 This depiction of Makuta is inspired by Makuta's final form in the Mata Nui Online Game. It was created for the Makuta Challenge on Lego Rebrick. My brother Aanchir assisted me with this MOC. "Uxar, Akida, and Melum combine their forms and powers to form Haikara, the Great Creature of Wisdom! With the strength and wisdom of three elemental creatures, Haikara is ready to assist Wairuha in the battle against evil! 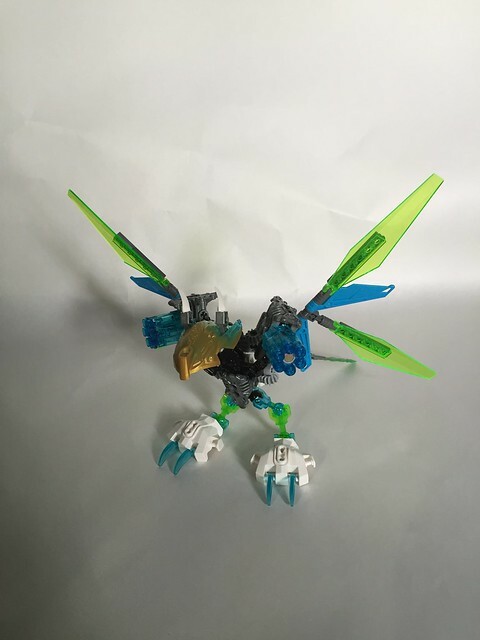 My Wairuha MOC topic has been updated with a "Creature Kaita"! Check it out! "When Kopaka, Gali, and Lewa unite their powers and forms, they become the mighty Wairuha! 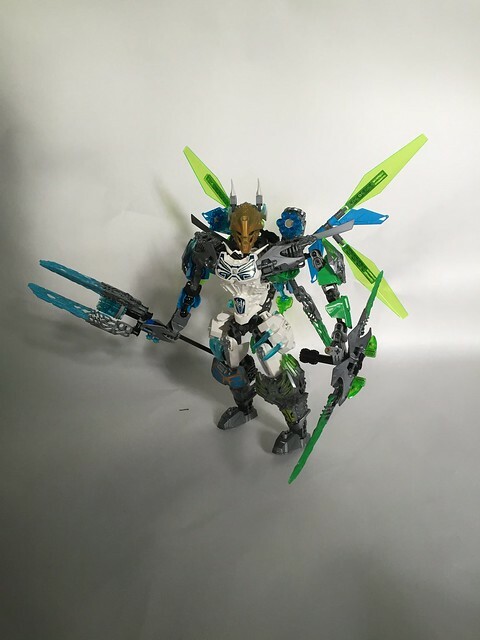 With the strength and wisdom of three Toa, Wairuha is ready to protect Okoto from whatever threats it may face!" 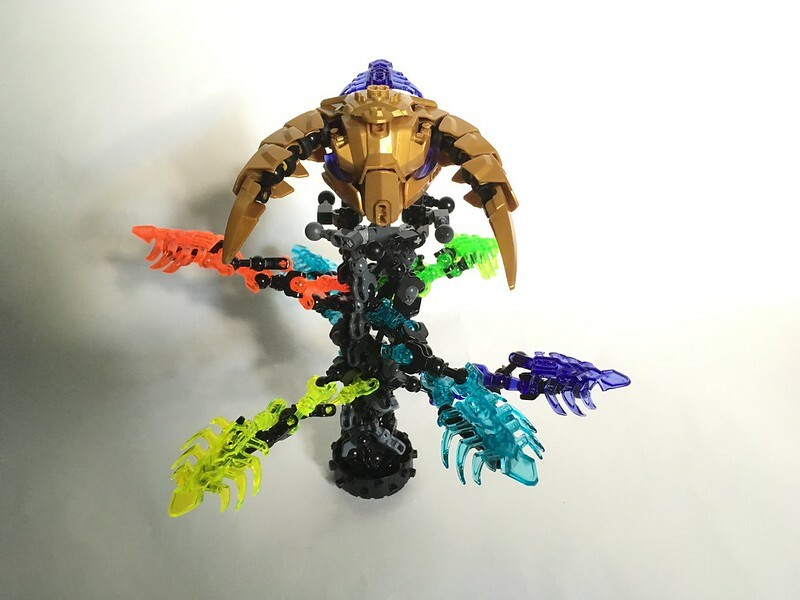 I have a new MOC topic in the Bionicle-Based Creations forum! Check it out for more pics and to leave any comments or questions you might have! Hard to believe it's been ten years since I first joined this little ol' website back in the heady days of 2006. Both myself and the site have come a long way since then. The myth of "cheap Chinese plastic" really needs to go away. It's not like ABS is some mythical formula only found in Denmark—it's a common material for manufacturing the world over. The only reason Lego's use of it is even remotely notable is that their competitors mostly use cheaper plastics. I'm really sick of the widespread and slightly racist notion that all Chinese goods are sub-par quality. Plenty of high-quality manufactured items, from iPhones to Lego, are produced there, simply because laborers there are accustomed to much lower wages than workers elsewhere—a boon for complex or detailed work that can't be automated to the same extent as other goods. There's an argument to be made that outsourcing labor to countries like China is exploitative and only perpetuates the lower standard for human rights there, but in all the whining I've seen from AFOLs about Chinese production, I don't think I've EVER seen anyone whose primary concern was the standard of living for the workers who made their plastic toys. Nope. All they ever care about is the end product, and if there are any deficiencies at all (real or imagined), the squinty-eyed Asians are the easiest scapegoats. Earlier I replied to a post in S&T about Bionicle G1 and G2 being connected, despite Lego saying it's a reboot. That point has been refuted a thousand times, but it got me thinking about the big problem with those sorts of theories in the first place. In science, one of the essential qualities that a theory can have is that it's falsifiable. What that means is that the theory is constructed in such a way that it can be proven demonstrably false by new evidence. Falsifiability is an essential part of science, and a big part of what separates it from pseudoscience, religion, and superstition. Obviously Bionicle fan theories are a great deal different from scientific theories. But I can't help but think that falsifiability should still be somewhat of a priority. If nothing (not even direct and explicit contradictory statements) can disprove your theory, than how is it even worth discussing? As an example, I can "theorize" that Matoran in G1 can reproduce like humans. Sure, Greg has stated the exact opposite numerous times. But he could have just been lying. Unless you're willing to accept evidence at face value, you can literally claim ANYTHING about the Bionicle story or characters and never be proven wrong. Vakama never betrayed the Toa Hordika because Web of Shadows wasn't canon! Mata Nui wasn't actually a giant robot, because the events of 2008 through 2010 never actually happened! All these theories and more are valid if there is no longer a single standard of evidence that can be taken as authoritative. P.S. : I don't want this to seem like I'm condemning headcanon. Just because the official story happens one way doesn't mean you're not allowed to reinterpret it, or pick and choose the parts you like! But for a fandom to function, there has to be some shared frame of reference that defines how a story or franchise is experienced. Headcanons won't necessarily make sense to someone who hasn't experienced the actual story and characters and doesn't understand where the headcanon diverges from that. That's the importance of canon—it defines and categorizes the official story as it was initially presented, so as to foster a shared understanding of the story among the fandom at large. Gali: Master of Water Poster! I finally got my signed Gali poster back from the framer! I won this at the BrickFair VA 2015 live charity auction. It's signed by the artist (and designer of the Gali: Master of Water set) Matt Betteker. 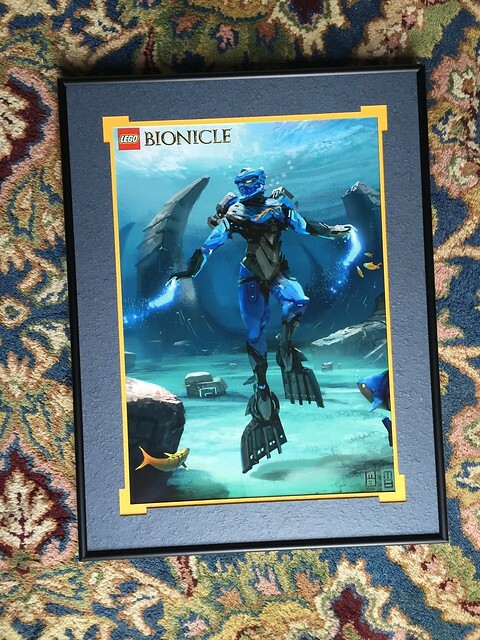 I knew I wanted to preserve it in as pristine a condition as possible, so I ended up spending more to frame it than I spent on the poster itself. But it ended up looking fantastic, and I'm eager to find a place to display it. Anyway, I'm too proud of this post to let it fade into obscurity, so I'm copying it here. About dang time we had a master topic for this. In any case, I suppose I might as well share mine. As most people know, I don't really want the two canons to be connected. I feel it would subvert the ending of the classic story and erase the independence of the modern story to try and haphazardly patch the two together. But I do have ideas of how I'd want the two to be connected if that were to occur. Firstly—and this is crucial—the two should be alternate universes at best. Okoto should not exist in the G1 universe, be it in the past, present, or future. Keeping the two stories independent of one another is paramount. And that's not to say that the universes should be "divergent timelines" or anything like that, either, since that would only make every difference between the two stories subject to endless scrutiny. If the writers are dead-set on the two universes having somehow diverged, then their differences shouldn't be linked to any one causal event, and the two universes should be considered to be just two of an almost infinite number of Bionicle universes, each with its own heroes and legends. Secondly—any crossover events, should they occur, should be rare and isolated. The absolute LAST thing I would want is for the universes to be crossable at any point by any idiot with an Olmak. That kind of randomness was my least favorite thing about the alternate universe shenanigans of the classic story. I don't want the new Toa crossing over to the old story just to wrap up loose ends in that canon, nor do I want the new Toa's overall quest to be abetted by interlopers from another world. Any crossover that occurs would be better off creating a new, independent problem to be solved and leaving the status quo of both universes intact, with neither group taking away anything more than memories and a valuable lesson of some sort. I don't think these conditions are too much to ask. They're pretty typical of a lot of crossovers between multiple franchises. To be honest, I'm not entirely opposed to a crossover story—in fact, if we got to a point where there were more Bionicle novels or graphic novels than it took to take that year's story, and they chose to create a one-off crossover in one of them, that'd honestly be pretty rad. But most people, when they propose connections, seem to want to tie the two canons together inextricably, where the events in one story directly affect the other in one way or another. And I just can't get behind that—the two stories are too different to reconcile without making a dent in one or the other. I'd rather the old story remain a closed book, with all its successes and failures preserved, and for the new story to be allowed to continue independently of that. Now that the three-week adventure of BrickFair VA–BronyCon–Family Camp is over, it's time I got down to business.